When Miss Arianna Rae Sapp, born May 26th, 1994, an active member of Seattle University’s Division I swim team, a personal friend, and tonight, also the ‘source’ of my interview sits down across from me in a crowded Starbucks off 12th Avenue in downtown Seattle and first notices my voice recorder, I notice her body stiffen. The look of apprehension on her face belies her kind smile. She’s clearly nervous. But I had a feeling this was going to be the case. Fortunately tonight, I’m exquisitely well prepared. I always try to stay at least three steps ahead of myself with anything I do, but especially when it comes to my writing. I arrived an hour before to practice the questions I planned to ask Arianna, over and over in my head, making sure I’d be hitting the proper tone at the perfect moment. 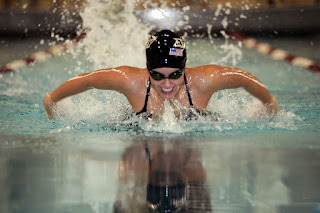 Even the uncounted hours I spent pouring over her high school and collegiate swimming career were meant to formulate a faultless set of questions that would set free the deep-seeded passion I see driving her, both in and out of the pool. I know that Arianna’s declared major at Seattle University is Psychology; hence why I begin with this well-known psychological technique known as guided imagery about which I really hoped was one of the most impactful moments in her life, to date. By doing so, Arianna was ripped from her stool inside a noisy Starbucks café in Seattle and thrown back in time, into her old high school pool in El Cajon, California again…or at least her imagination was. When she finally opens them again and looks back at me, her light green eyes are vacant, but in a good way. I think we both know the imagery had worked. Mind you, I’m only a Creative Writing major after all... but I swear that I see the future psychologist in her flash me a knowing grin, momentarily, just before she answers. She pauses and a look of pain momentarily crosses her face. For a brief moment, her radiant eyes fill with melancholy. Then she says something that takes me completely off guard. I watch her struggling to find the right words to say as she searches for the exact words to properly give such an inexpressible feeling of pure elation some sort of relatable meaning. In my scramble to jot words like euphoric and guilt down in my notes, the actual joy Arianna must have been feeling at that moment goes completely unheeded by me until long after the moment had slipped into memory once again. One of the problems with staying three steps ahead of yourself all the time is the fact that you’re never truly present. As her voice softly trails off, she sinks back into her stool intrigued and much more at ease now. Her feet have finally stopped kicking. The rest of the interview continued along in similar fashion, each question revealing more of Arianna’s kind-hearted, passionate, and extremely devoted personality. However, I now see that it’s far from necessary to transpose the entire interview since my first question tells you everything that you need to know about Arianna Sapp’s character. And since making that revelation, I have come to the realization that the key to conducting a good interview is not about hitting the proper tone at the perfect moment or formulating a faultless set of questions to ask. Rather, it’s about turning your interview into a conversation, and preferably a conversation that you’re both swimming in. That’s the real key to transforming a simple portrait piece into a masterpiece.